Queen’s Theatre at The Lab, Tue 21 Feb. When a psychiatrist needs help, to whom does he turn? A ‘positive reinforcement’ calendar? A set of ‘self-help’ tape recordings? Nup. It’s actually all about the drugs. And if you can’t get it on the street without a prescription, then you’re gonna have to take matters into your own hands. Such is this darkly amusing story where a sociopathic psychiatrist seeks to ‘convince’ his psychiatrist to hand over the good stuff, no questions asked. Writer/Actor Stewart J. McMillan has penned an entertaining piece of theatre exploring what might happen if a shrink is actually in a worse state than his patients. In multiple roles, including as the psychiatrist trying to lead his disturbed colleague toward the light, McMillan did well to handle a few accent changes and made a convincing bearded teenage girl, when the script required. The absurdity of this particular role added to the fun, and McMillan was able to milk those moments to great effect. Actor Luke Richmond was amusingly annoying as the troubled therapist Dr Jeremy Roberts while inventive scene changes gave space for his comedic talents to shine forth. Much of the material had potential; however did not always hit its target. That is not to say that the comedy completely missed its mark either… there were many laughable moments that kept the audience smiling, it’s just that it should have been funnier than it was on this night. Having said that, there were indeed flashes of brilliant silliness, despite the number of ‘flat’ spots throughout the show. In an overly-long script that could have been cut by 15 minutes or so, things take a dark turn toward the end, adding an interesting twist as we discover the truth about the wonderfully portrayed ‘Allen’ and his antisocial deeds. This is when the energy really ramps up, the almost slapstick treatment of a deliciously dark ending a great way to close the show. 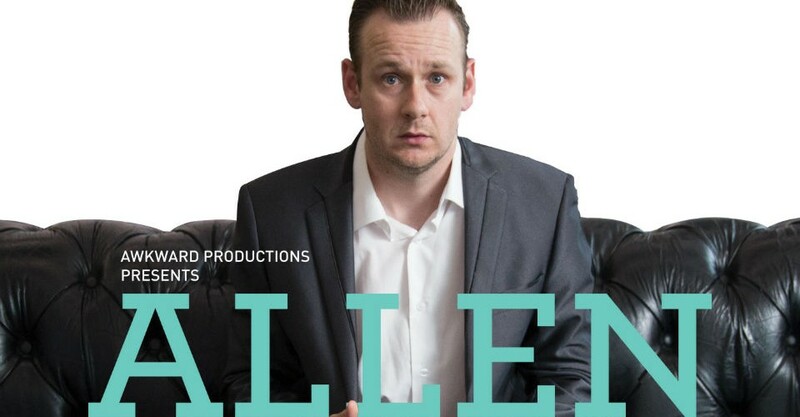 Allen continues at Queen’s Theatre at The Lab, at various times, until Sat 10 Mar.